MELBOURNE - Tennis officials Tuesday unveiled plans for new courts and refurbishments at Melbourne Park as part of a multi-million dollar upgrade to stop other cities poaching the Australian Open. 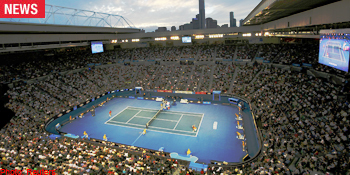 The improvements, part of an extensive redevelopment, include 21 extra courts, an upgrade for the main Rod Laver Arena and Hisense Arena, a raised public plaza and a new entrance to the venue in the heart of Melbourne. The upgrade to the ageing facilities in the heart of Melbourne, flanking the Melbourne Cricket Ground, is aimed at stopping Sydney, Shanghai or Dubai swooping for the lucrative Grand Slam tournament. The 363 million dollar (361 million US) first stage of redevelopment is expected to be completed by the tournament's 2015 edition, while the overall revamp is expected to cost around 800 million dollars. Work will start next year on a new Western Precinct that will add 1,500 seats and a retractable roof to Margaret Court Arena, the third biggest venue, making the Australian Open the first Grand Slam to have three covered courts. The Australian Open was moved from Kooyong to Melbourne Park, which flanks the famous Melbourne Cricket Ground, in 1988. The venue's current contract expires in 2016, but it has been guaranteed hosting rights until at least 2036.